No classes and work on Wednesday, August 21, 2013, because it is a NINOY AQUINO DAY, declared as national non-working holiday by the Philippines and observed annually every August 21. 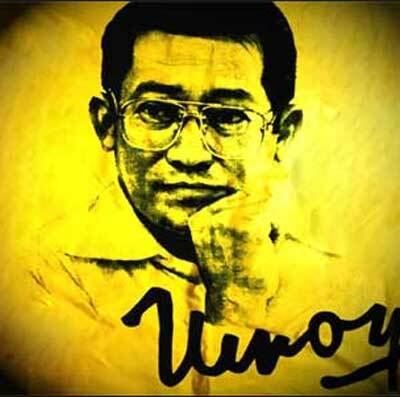 Ninoy Aquino is the deceased Father of the current President of the Philippines. Ninoy Aquino Day is the commemorating of the anniversary of the 1983 assassination of former Senator Benigno "Ninoy" Aquino, Jr, according to Wikipedia. A bit of background history about Ninoy Aquino. He was a well-known opposition and critic of the former-President Ferdinand Marcos. Aquino was later imprisoned for about 8-years after martial law was declared in the Philippines. After suffering from a heart attack in March 1980, Aquino and his family fly to the United States for medical treatment. Then in 1983. Upon returning to the country at the Manila International Airport (now known as Ninoy Aquino International Airport), he was shot and died on August 21, 1983. And on February 25, 2004, former President Gloria Macapagal-Arroyo signed the law under Republic Act 9256, that Ninoy Aquino Day was a special non-working day of the Philippines. 2. He or she shall be paid an additional 30 percent of his or her daily rate on the first eight hours of work [(Daily Rate x 130%)+ Cost of Living Allowance], if the work done during this special non-working day. 5. For work done in excess of eight hours (overtime work) during a special day that also falls on his or her rest day, he or she shall be paid an additional 30 percent of his or her hourly rate on said day (hourly rate of the basic daily wage x 150% x 130% x number of hours worked). Thank you for reading this post, If you like this details, please bookmark it now or visit this site more often for you to be updated. You may also share this post to your friends so they may know about Ninoy Aquino Day 2013. Comments or suggestions about "#Walangpasok on Wednesday August 21, 2013 | Ninoy Aquino Day 2013" is important to us, you may share it by using the comment box below.